Oops, I don’t have enough yarn! One of the first things that you learn when you begin knitting, is that when working on a project, make sure you have enough to finish it. Patterns tell you how many skeins you’ll need or at least usually how many yards. It’s better to have more yarn than necessary that not enough. It’s also best to have enough of the same color lot so that you don’t have those pesky differences in shading. Normally, when yarn is made, the dye is created and all of yarn is made with that/those colors. For example, XYZ wool dyes 200 skeins of purple wool on Tuesday. On Thursday, it will dye 200 more skeins of wool. Those two dye lots are going to be a tiny bit different, no matter what. So, if you want to knit your purple sweater, it’s best to get all your yarn out of one dye lot to make sure the front and back (or top and bottom) are the same shade of purple. With this in mind, you have to know what you are using your yarn for before you buy it. I had bought about 6 skeins of Paton’s Baby yarn about a year ago when my friend was pregnant. I made a small baby blanket and set the rest aside. A little over a month ago I decided to make another blanket and figured I could go out and find more if I needed it. After all, it is a popular company with yarn available in Michael’s and Jo-Anns. I was at the end of the last skein and went out to find more. Paton’s Beehive Baby Sport Yarn in Natural Girl was nowhere to be found. Rather than keep searching, I decided to finish the blanket early. The border had to be finished in 10 rows rather than 12. All in all, I was lucky and the blanket looks fabulous- but I was lucky. Did I learn my lesson? Absolutely not! 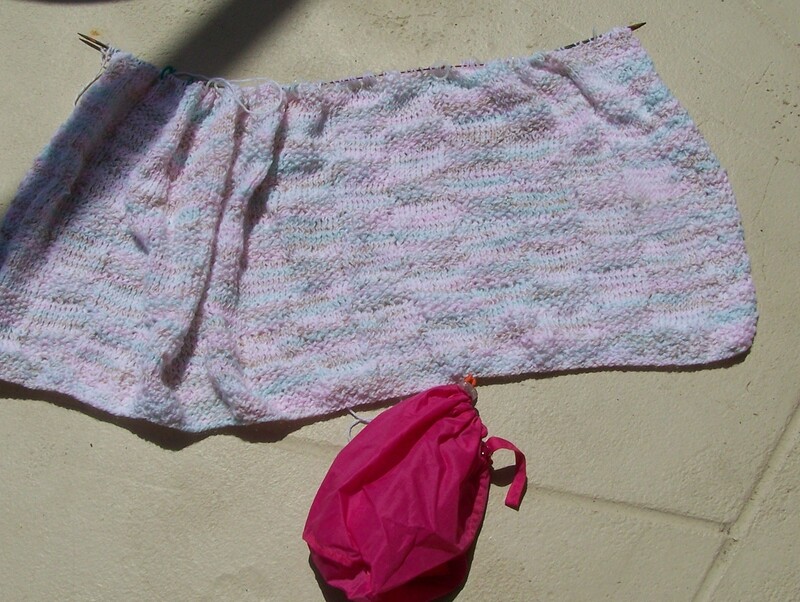 I am using Patons Beehive Baby Yarn in 11421 Natural Girl colors. It has tones of pink, blue, beige and white. 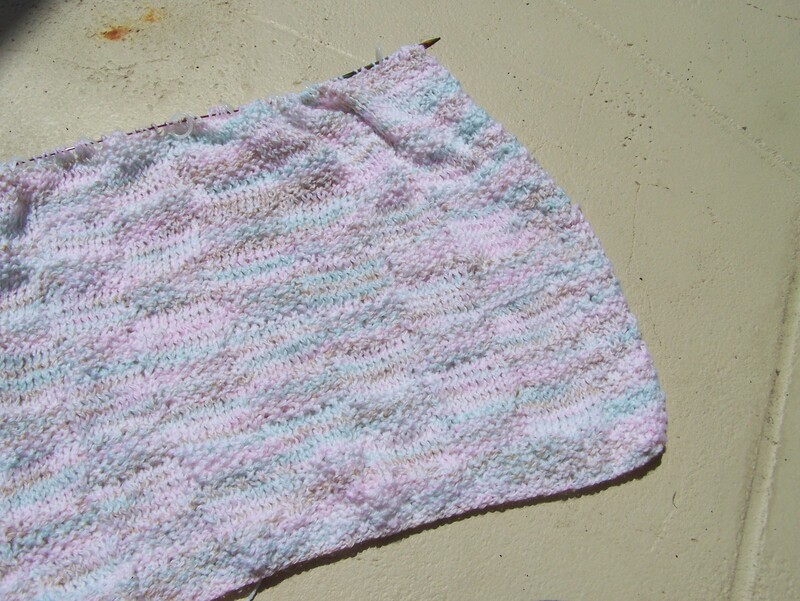 There is a double seed stitch border, with alternating squares in stockinette and seed stitch. Size 4 circular knitting needle at least 16 inches long. Using stich markers every ten stitches will help keep track of the changes. Repeat Rows 21-24 through Row 30.
continue in this manner until you’ve knit the desired length of blanket. Ending: Repeat Rows 1-4 for a total of 12 rows. Bind Off.